Windrush Yachts approached Bloomfield Innovation to design the hull for their new F-18 Edge last year and design work started at the end of September (2009). 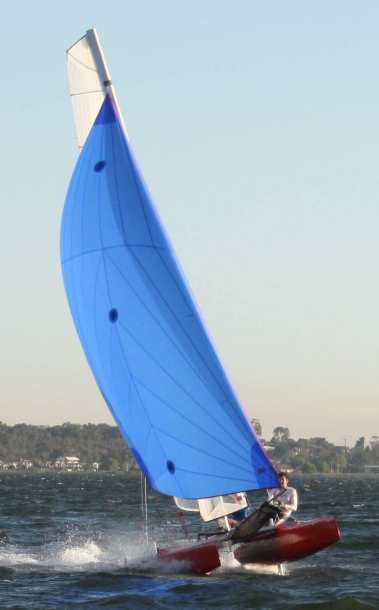 In less than four months the boat has been designed, production moulds completed and the first two boats built and sailing; the boys have only had a few days sailing to set the boats up before driving all the way across the country (Australia - they are currently en route) to compete at the Nationals. During the design process Windrush provided valuable practical feedback about the characteristics they were looking for in the new design and the negative traits of competing designs; this allowed us to tailor the design to incorporate those characteristics and explain the effects of the various hull features to the client. The new design is derived from our current, highly successful, larger catamaran hull series appropriately modified for this particular application. A prominent new feature is the "Edge" or chine that extends the full length of the hull parallel to the waterline and the bow profile that is vertical below the "Edge" and raked aft above it. This chine serves a number of functions including providing an aesthetic signature for the design and a number of performance enhancements in resistance and sea-keeping. We are well aware of how competitive the F-18 field is and it is a big challenge to enter such a well developed class with so many big names pushing years of specialised development. Only time will tell, but early indications are very encouraging in a range of wind conditions.